A patient at a Wuhan hospital gave medical staff a demonstration of his amazing Shaolin monk like 'wugong' powers after he recovered from a serious jaw injury following a car crash. 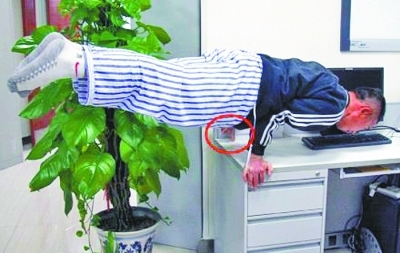 The photo was posted by a Dr Wan Qilong at the Wuhan Stomatological Hospital, who said it was of a 37-year old patient demonstrating his martial art skills by balancing horizontally on a table using only his finger. The manouevre is known as "One Finger Meditation", according to the report in Ifeng News. Dr Wan said the patient had suffered a broken jaw in a car accident and had been treated at the plastic surgery and orthopaedic departments of the hospital to recover his function. At first the man known as Chen Mo was unable to open his mouth or eat, and it took him two months to recover his jaw function. He was so grateful to the doctors and nursing staff that he said he would give them a demonstration of the martial arts skills that he had studied since childhood. Just before he was discharged from the hospital Chen Mou demonstrated the "One Finger Meditation" and staff were amazed by his skill. The photo of his balancing act was posted by Dr Wan on the internet and it has since attracted a lot of comment.